1. How can I reach a product that i am looking for? 2. What is an "Automotive Application "? 3. What is listing by Automotive Application ? 4. What is a "Manufacturing Line"? 5. What is listing by Manufacturing Line? 6. Why these "Automotive Application s" and "Manufacturing Line" dimensions? 7. How do you define the inter-relationship between Automotive Application and Manufacturing Line? 8. Why are you providing the link between Automotive Application and Manufacturing Line? 9. I click on a product I am interested in and i reach an entirely different category, why? 10. Why clicking on a product name takes me to another listing? 11. What is BROWSE ALL? 12. What is SEARCH PRODUCT & SERVICES? 13. Why does results of browsing and search take us to Automotive Application listing? 14. While browsing through the product list, i am not able to find the product of my choice in your product list, what do i do? 15. Im in a hurry & dont want to go through your product list, still i want to send a product request, can i do so? A single product that you are looking for is made available in any of the following 2 dimensions. Alternatively, you can locate an item by using the following general options. b. By simple text Search. 2. What is an "Automotive Application"? 3. What is listing by Automotive Application? An Automotive Application means the functional Automotive Application of a product to a particular section of the automobile vehicle. For e.g. : Engine parts, gear box parts, suspension items etc. Listing by Automotive Application displays together all the Automotive Application groups like engine part, suspension parts, gear box items etc. Clicking on any of the Automotive Application will take you to the page containing all components of that specific Automotive Application group like all engine parts enlisted together. Thus all the components of the engine like pistons, rings, pins, crankshafts, connecting rods etc are listed on a common page of engine parts. 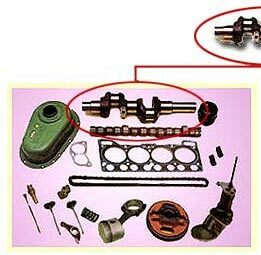 A crankshaft can be located in the Automotive Application page: engine parts. A gear box, main shafts, speed gears can be located in the Automotive Application page: gear box parts. Listing by Manufacturing Line displays together all the Manufacturing Line groups like forged items, castings, sheet metal items, rubber & elastomers etc. Clicking on any of a Manufacturing Line will take you to the page containing all the items of that specific Manufacturing Line like all the forged components enlisted together. Thus all the items of the Manufacturing Line forged components such as crankshafts, yokes, cross holders, flanges, hubs, etc are listed together on a common page. A hub bolt or a wheel stud can be found in the Manufacturing Line page: fasteners :typical automotive application. 6. Why these "Automotive Applications" and "Manufacturing Line" dimensions? Our experience says that an automobile component can be viewed either by its Automotive Application to a vehicle section or by its primary industry of manufacturing / processing or the raw material ingredient being used which we describe as a Manufacturing Line. (Refer to FAQ 2 & 4 What is Automotive Application / Manufacturing Line?). This we feel will ensure flexibility to view and select the allied items, if necessary, in any of the dimensions, along with the item of your interest. As you can see in the example above a crankshaft is displayed under the Automotive Application: engine parts as it is one of the prime components of an engine. Simultaneously the primary industry / process of its manufacture for the crankshaft is forging industry hence it is displayed under the Manufacturing Line forged components as well. Now let us explain the above example from your angle. Suppose you have clicked on theManufacturing Line forged components and you find that you want to send us an enquiry on crankshafts. At this juncture, our past experience suggests that you may also require other fast moving items of engine parts along with the crankshaft. So we have facilitated our website such that clicking on the crankshaft (while in Manufacturing Line) will take you to the Automotive Application listing engine parts and there you can also order allied engine parts like camshafts, gasket kits, main & connecting rods etc. Now let us see the reverse situation. Suppose you have clicked on the Automotive Application engine parts and you find that you want to send us an enquiry on crankshafts, here it may so happen that you may also like to order other forged components along with the crankshafts. 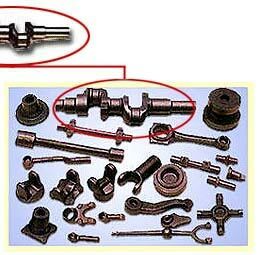 So we have facilitated our website such that you click on the crankshaft (while in Automotive Application) will take you to the Manufacturing Line listing forged component where you can also order other forging items such as connecting rods, yokes, cross holders, flanges, hubs etc along with the crankshafts. Like wise all our products are having two dimensions like an engine mount can be from under the Automotive Application engine parts and also in the Manufacturing Line: rubber parts. Clicking on the name engine mounts in Automotive Application listing takes you to the Manufacturing Line: rubber parts, which is the other dimension of the engine mounts. Note: The Browse All function is related only to our product database where we have displayed only the prominent automotive components listed in alphabetical order. Thereby, if you are a technocrat from any other industry, you may not find the product of your interest in the Browse All facility. We therefore recommend you to send us detailed requirement by clicking on the Enquiry button on the side panel whereby you will be offered Free space for you to write on-line about your required Customized Items with facility to attach your Drawings/specification files to send us your detailed Enquiry (without browsing/selecting from the our product listings). 12. What is SEARCH Products & Services? Note: the Search A function is related only to our database where we have displayed only the products related prominent automotive components & that too in generic names. Therefore, if you are a technocrat from any other industry & are unable to find the product of your interest then you should opt for the Search C facility that will take you to a list of our various Manufacturing Lines & click on any Manufacturing Lines you will get a display of our various items from that particular manufacturing activity. From this page you either can send a direct enquiry by clicking on the Flashing Instructions or you can browse thru our product list that is displayed below & select an items to send your enquiry thru the collection in basket. When you click at any of the items listed under the results of Browse All or Search, you are taken to the Automotive Application listing. This is so because we believe that most people related to the automotive sector identify products with their Automotive Application. Therefore, it is appropriate that you as a visitor view the items with the Automotive Application listing. Since many items under one application are demanded parallelly, we have tried to make the issue simpler by putting all the items under the same Automotive Application with the item chosen, thereby enabling you to pick and chose whatever you want from the same listing. However, we always have the option open for you that by clicking on the item name in the Automotive Application listing takes you to the Manufacturing Line of that item. To conclude, from the Search or Browse All listing of an item you can reach its Manufacturing Line only via its Automotive Application. Clicking on the same will take you to the next screen wherein you are provided with a blank format to enter details of your required Automotive items. This user-defined item will then be added to the existing set of your chosen products. Alternative solution: before using this option we suggest you to look into the Browse All option where all our existing items are alphabetically listed.